House of Nines Design: Circus Costume Etc. My circus costume is now almost completed. As usual, before I started, I said 'no problem! this won't take long'. But, sewing this crazy petticoat (red and white gingham taffeta with matching and red silk dupioni ruffles) took a week. So. Many. Ruffles. The circle skirt to go over it also took a week. 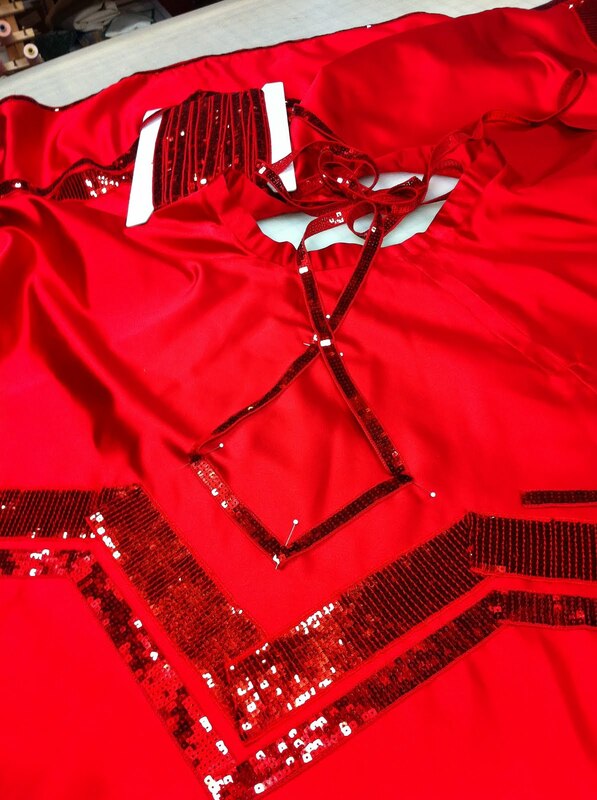 I made it in red silk satin with gobs of sequin trim and giant antique red glass sequins. It took almost the whole week just to sew on the trim. I'll be wearing these with this red satin corset. It's currently back at the shop (i.e. Dark Garden) for a tune-up: they're kindly adding shoulder straps for me, and making a matching stomacher that I'll bling out to match the trim on the skirt. I need a feather headdress of some kind to go with it, but haven't had a minute to think much about that yet. Thankfully, since finishing those pieces other things are moving along more quickly now. I've finished one linen 18th-century style shirt (originally intended for John, but it turned out too small, so now it's mine) and have cut out the pieces for three more. Also, I have three skirts and some giant red and white striped harem pants cut and ready to sew this weekend. Production line makes things go faster. Only 47 outfits and hats to go! That looks great, I just finished making a can-can skirt covered in ruffles, it was so unbelievably heavy. Is this one heavy? Yes Ruth, it's a little but heavy, but not too bad. I used a poly twill tape instead of horsehair on the ruffle edge, to give i some body without being too springy / plastic-y, and that might have added to the weight some. It wouldn't have taken as long to make if I has used a ruffler attachment on a machine, but I stupidly made the ruffles by hand. It was fun though. So nice to keep up with you and the hubs goings on as you prep for your fantastical adventures. Hope you two are well. Thinking about you.